From our location in Gort, Ireland, deep in WB Yeats country, we were directed to the Orkney Islands. Elyn joked that WB Yeats was handing us back to Elen of the Ways, who would be our guide for the next part of our journey. We had visited Orkney before, to do research for our book Powerful Places in Scotland, but we hadn’t been thinking of returning. Getting to Orkney is a bit tricky. One can travel by air from several locations in Scotland or by ferry from three Scottish locations, but we were in Ireland. We considered the various options and decided to fly from the nearest airport, Shannon, to Edinburgh, and then to Kirkwall on Mainland, the largest of the Orkney Islands. It was complicated. WB Yeats and Elen of the Ways, trustworthy as they were about our destinations, appeared to be clueless about the complexities of twenty-first century travel. Perhaps they were just not concerned about such minor details. Nor did they know anything about accommodations and hiring local, in-the-flesh guides. Making hotel reservations in Kirkwall took several calls, and we chose our dates based on the severely limited availability of hotel rooms. Although it was early September, Orkney was still full of tourists. (We later learned that cruise ships have started to include Orkney on their itineraries.) Getting into the sites we wanted to see, in particular the Tomb of the Eagles, was also problematic. A limited number of local guides take tourists around the islands, and most were already booked. The Towie Ball in the National Museum of Scotland. Edinburgh was not a destination that Elen of the Ways had specified. It was simply a stopover between Ireland and Orkney. But we took advantage of our visit to see the Towie Ball and the Isle of Lewis walrus-ivory chess pieces at the National Museum of Scotland again. The Towie Ball and other similar balls found mostly in Scotland, are elaborately carved stone balls dating from around 2500 BCE. They fit easily in the hand. Their purpose is a mystery. Some have elaborate spiral patterns incised into them and others have protruding bump-like, knobs. We had to ask several museum guides at the National Museum before we were able to find the stone balls tucked away in a small side room in the museum. They are indeed a puzzle. Are they displays of artisanal excellence? Game objects? Journeyman practice pieces? Nobody knows. By the way, Elyn is reading an interesting book by Lynne Kelly called The Memory Code, which presents the intriguing possibility that megalithic sites and objects like the Towie Ball were created as aids for the non-literate memory. This is pure speculation, since no written records exist for such early times, but Kelly cites the “song lines” of the Australian aborigines as modern evidence of the use of physical objects by non-literate people as memory aids. The Orkney Islands from the air. Part of our process on this guided walkabout was to learn discernment: what we needed to plan in advance and what we needed to leave open for serendipity and surprise. Clearly we needed to plan for a tour on Orkney or we wouldn’t have anything to do when we got there! But if we got into detailed planning of every step, we would miss the fortuitous opportunity that might present itself. Sometimes it felt like walking on a knife edge, but I was learning to let go of my life-long pattern of over-planning. If nothing else, this way of traveling put me outside of my comfort zone. 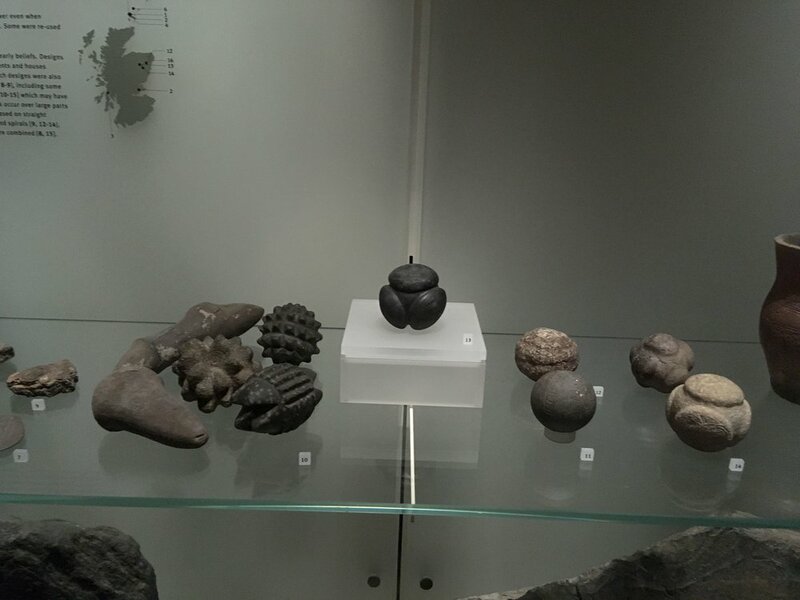 Carved stone balls in the Kirkwall City Museum. We arrived in Kirkwall and took a taxi to our hotel. Then we walked over to see St Magnus Cathedral, a red sandstone, Romanesque (and later) church containing many gravestones, most with the skull and cross-bones inscribed on them. We found one that had both the skull and bones and an antlered reindeer—a welcome reminder of Elen of the Ways. After another short walk, we explored the small Kirkwall City Museum where, to our surprise, we saw more of the carved stone balls that we had seen in Edinburgh. They were part of a special exhibit. The next two days were devoted to island hopping (once by car and once by ferry) and visiting megalithic sites with the two local guides we had hired. 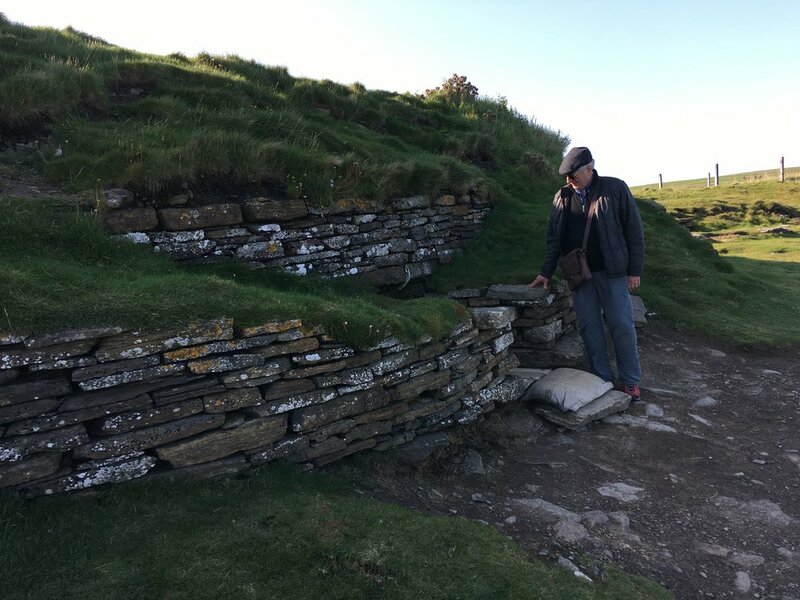 Perhaps I am jaded after being in numerous megalithic dolmens, but I found those on Orkney to be clumsily restored, with all-too-much concrete in evidence. Even the Tomb of the Eagles, which we had heard so much about, seemed over-restored. Entrance to the Tomb of the Eagles. The 3,000-year-old Tomb of the Eagles was discovered in 1958 by a South Ronaldsay farmer, Ronnie Simison. He noticed some horizontal stones near the sandstone cliffs bordering his farmland. Digging down, he found a beautifully polished mace head, three stone axe heads, and a stone knife. Further digging revealed a stone chamber containing 30 human skulls and the talons and bones of about 14 sea eagles. 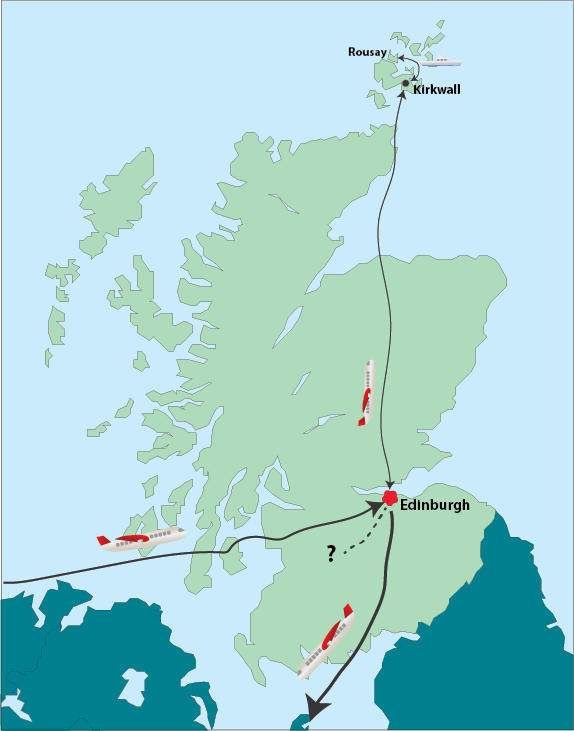 After an archaeological study of the site, Ronnie developed it as a tourist attraction. It remains a private site managed by two of his daughters Getting to the site requires a one-mile walk on farm roads and grass paths. Entrance into the site is via a narrow, low passageway that requires crawling or using an ingenious trolley similar to the carts that mechanics use to roll under a car. The setting is spectacular, but I was unimpressed by the Tomb itself. The Ness of Brodgar archeological site. There have been major new discoveries at the Ness of Brodgar on the Mainland. The structure, dated to around 3,300 BCE, lies between the Ring of Brodgar and the spectacular Stones of Stenness. This site was unknown when we first visited the island. Excavations began in 2003 and cover over 6 acres. The Ness appears to be the largest megalithic structure in the Heart of Orkney World Heritage Site. Unfortunately for us, the digging season was over at the end of August, so all we saw was the site covered with black plastic tarps anchored by old auto tires. We looked through the perimeter fence before moving on to the Ring of Brodgar and the Stones of Stenness. The Heart of Orkney World Heritage Site is one of the richest surviving Neolithic landscapes in Europe, and the Ness of Brodgar promises to contribute greatly to our understanding of the Neolithic period. While we were preparing for our trip to Orkney we consulted our “oracles” and got that we should go to the Isle of Man after Orkney and then return to Wales to complete the circle we had begun at Sarn Helen. We made the necessary plane and hotel reservations before flying back to Edinburgh. However, when we arrived in Edinburgh, we found our same-day flight to the Isle of Man was delayed, and, after several hours, cancelled. This was another lesson in the fallibility of guides from other dimensions. As accurate they may be about destinations, they have no concept of the practicalities of travel. After a short deliberation, we made an “executive” decision and opted to fly directly to Cardiff, Wales. A flight was available, and within hours we landed in Cardiff and wearily dropped into bed at the hotel we had booked using a last-minute hotel phone app. Earlier, before our travel to Orkney, we had muscle-tested about when we should finish our journey. I was still uncomfortable with this open-ended itinerary and needed some structure-at least a closing date would help! We got September 13 more or less. Because of the cancellation of our visit to the Isle of Man we had arrived in Wales early—on September 4. So the question now was what to do and where to go in the more than a week we had left. Would our guides reconsider our itinerary? Stay tuned!